Silver prices largely consolidated sideways last week in the 18.30 per ounce region following the sharp sell off and recovery of the previous week and ended trading in a relatively narrow range between 3 of our short term moving averages. 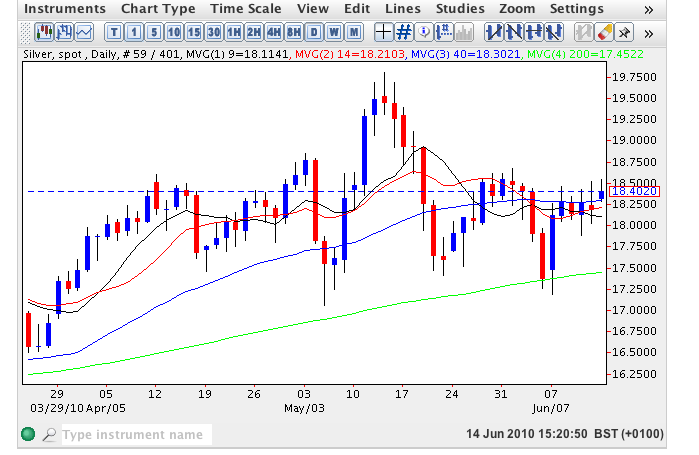 However, the lows of each day found good support from the 14 day moving average suggesting a bullish tone to silver trading at present and indeed so far this morning silver prices are trading higher at $18.45 per ounce. Provided we see a break and hold above $18.70 then the recent positive sentiment for silver prices should be further confirmed and as a result we can expect to see a further run towards the recent high in May of $19.80 per ounce. With this morning’s price action now above all 4 moving averages the short term outlook remains positive.